In the academic world, plagiarism is considered a serious crime and offenders are prosecuted “when” caught. But rarely are the offenders caught. However, in the SEO game where search engines (like Google and Bing) are the umpires, it is difficult to evade punishment when you plagiarize. In fact, there is zero tolerance for plagiarism and no time for legal proceedings. If you plagiarize, the punishment is outright blacklisting, ban, or drop in keywords rank. So, if you don’t want to mess up your SEO efforts, it is better to put in the work and desist from copying content from other websites. To be safer, make sure that you check your content for plagiarism, even if you didn’t copy from any website. Sometimes, you unknowingly create a sentence that is similar in a way to the one another website. Search engine crawlers may pick it up as a plagiarized sentence and penalize your website for it. 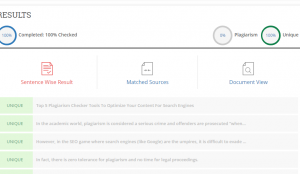 Small SEO Tools: Probably the most popular plagiarism checker tools out there, Small SEO Tools is a free web-based platform offering a wide array of services to Content Writers. One of the popular services offered by the website is “plagiarism check”. This feature of the website allows you to check your content for free without any sign-up. However, you are only allowed to check a maximum of 1000 words per session. This may not be convenient for you if you create long-form content exceeding a thousand words. This is what the interface looks like – simple and easy-to-use. Apart from the plagiarism checker tools, Small SEO Tools also offer other useful and not so useful features including domain authority checker, backlink checker, keyword position, word count checker, and article rewriter – please never try this. Quetext: This one isn’t as popular as Small SEO Tools but it is quite as effective and even better because it has no word limitation and also checks your spellings and punctuation marks at the same time. In addition, it is easy to use and only involves copying and pasting the content that you want to check. Like the later, you don’t need to sign up to use Quetext. Grammarly: This is Content Writers go-to tool for grammar checks. However, not everyone knows that Grammarly also has plagiarism checker tools. This is because it is a premium package that is available for only paid users. However, it is highly accurate as it compares your content with over 8 billion web pages and indicates within seconds whether or not you have duplicate content with any other page on the web. Plagscan: If you are looking for something more advanced than Small SEO Tools, Plagscan may be another option for you. But you have to sign up to be able to use the plagiarism checker feature. With Plagscan, you can check your content by either upload different file types including word document and PDF, or directly pasting your content into the text box provided. 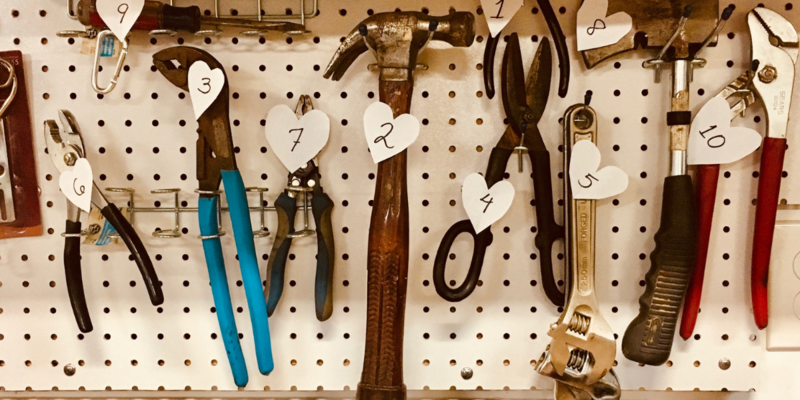 Unlike Small SEO Tools, you can upload a document of up to 2000 words in one go with an option to go beyond that if you sign up for the paid version. Copyscape: Copyscape is more than just plagiarism checker tools. It is widely used to check for duplicate content by simply adding the URL of the page that you want to check. 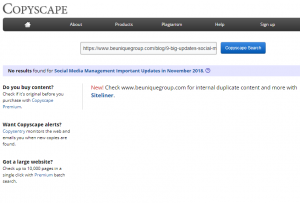 The image below shows that a particular webpage on Be Unique’s website has not been plagiarized – Good news! This is important if you want to find out if someone is stealing the content on your web pages. You can also find out if you have content that is similar to what is on another website. This will help you to make changes and avoid being penalized. These are just a few of the popular ones. There are many plagiarism checker tools out there – both free and paid one. Using any one can save you the heartache of being penalized by search engine crawlers. But make sure you use a reliable one, even if it means paying a token for it. Struggling to get results from your SEO efforts? We are a premier Google partner offering SEO/SEM services that help our clients see results in the quickest time possible. Feel free to call or send us a message for consultation.